Welcome to Day 4 of the winter American Astronomical Society (AAS) meeting in Kissimmee! Several of us are attending the conference this year, and we will report highlights from each day here on astrobites. If you’d like to see more timely updates during the day, we encourage you to follow @astrobites on twitter or search the #aas227 hashtag. Another excellent prize lecture started off today’s sessions. The Helen B. Warner Prize is awarded for achievement in observational or theoretical astrophysics by a young researcher (no more than eight years after their Ph.D.). 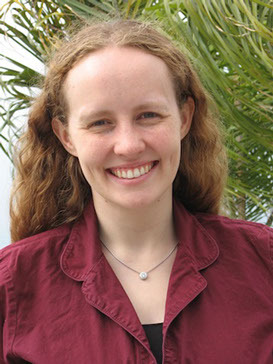 This year’s Warner Prize was presented to Ruth Murray-Clay of UC Santa Barbara. For her award lecture, Murray-Clay told us all about planetary system architecture: the number, masses, and orbits of planets in a given system. The underlying question motivating this type of research is: How rare is the Solar System? In other words, how likely is it that a given planetary system will have rocky planets close to their star, gas giants farther out, and ice giants at the outer reaches of the system? Answering this question will help us solve the physics problem of how and where planets form, and will also help us on our search for other planets like Earth. The data on exoplanet population from transit and radial velocity observations and from direct imaging tell us that our Solar System is not “common” (many systems we observe have much more eccentric gas giants), but that doesn’t mean it’s not typical. While we wait for more and better observations of exoplanet systems, theory can help us understand why the Solar System formed the way it did, and where to look for systems that formed the same way. For example, some of Murray-Clay’s previous work has shown that metal-rich stars tend to host more hot Jupiters and eccentric giant planets (very different from Solar System architecture). So if we want to find more systems like our own, we need to search around stars with low-to-moderate metallicity. This session was a mashup of a variety of planetary topics ranging from solar flares to interiors to habitability. Leslie Rogers kicked off the session by presenting work done in collaboration with her student Ellen Price to constrain the composition of the ultra-short period (4 hours!?!) planet candidate KOI 1843.03 using models of the object’s interior. Since it’s so close to the star, it can only exist without being torn apart if it’s very dense, which allows them to calculate that it must be iron-rich like Mercury! Next Kevin Thielen, an undergrad at Eckerd College, presented results from a summer project to apply a variable polytrope index to planet models. Tom Barclay then showed models that demonstrate the huge effect that having giant planets in the outer solar system has on the formation of terrestrial planets. He finds that without Jupiter and Saturn, more planets would form (8 instead of 3-4!) and giant impacts (like the moon-forming impact) would be more frequent but less energetic. Aomawa Shields shifted to discuss her 3D GCM models to determine the orbital configurations that would lead to liquid water on the surface of the planet Kepler-62f. She determines the effect of eccentricity, axis tilt (obliquity), and rotation rate on habitability. Edward Guinan brought us closer to home discussing the potential for “superflares” — solar flares up to hundreds of times more energetic than normal—in our solar system. Analyses of Kepler data suggest that these flares likely happen every 300-500 years in Sunlike stars (way more often than previously thought! ), and would devastate communications systems on Earth (and hurt astronauts in space). Peter Buhler and Taisiya Kopytova finished up the session. Peter showed how he used Spitzer secondary eclipses and MESA models to determine the tidal love number and core mass of HAT-P-13b. Taisiya presented her thesis work on observations of brown dwarfs and low-mass stars. She shows that in many cases, particularly for young objects and cold objects, the models for these objects do not fit the data very well! The final press conference of the meeting was all about the fourth generation of the Sloan Digital Sky Survey. In the opening talk, Michael Blanton (New York University) presented some early results from SDSS-IV, which is slated to run from 2014 to 2020. The major components to SDSS-IV are extended Baryon Oscillation Spectroscopic Survey (eBOSS), a cosmological survey of quasars and galaxies; APO Galactic Evolution Experiment (APOGEE-2), a stellar survey of the Milky Way; and Mapping Nearby Galaxies at APO (MaNGA), a survey that will map the detailed internal structure of nearly 10,000 nearby galaxies. Next up was Melissa Ness (Max Planck Institute for Astronomy), speaking about APOGEE’s creation of the first global age map of the Milky Way. 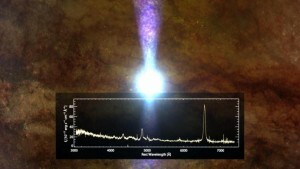 APOGEE obtained the spectra for 70,000 red giant stars. These spectra, combined with the stars’ light curves, allowed the team to infer the ages of these stars distributed across the Milky Way galaxy. The resulting map is shown in the video below. From this map, Ness says it’s pretty clear: the Milky Way started as a small disk, and it’s expanded out from there, since. “Our galaxy grew, and it grew up by growing out.” Here’s the press release. Francesco Belfiore (University of Cambridge) gave the next talk, cleverly titled “Proof That Some Galaxies Are LIERs.” The title is a play on the astrophysical source known as a LINER, or Low-Ionization Nuclear Emission-line Region — an area within a galactic center that displays line emission from weakly ionized or neutral atoms. These have commonly been interpreted as being a wimpy active galactic nucleus (AGN). But a closer look with MaNGA, which is able to take spectroscopic data for the whole galaxy at once, has revealed that these sources are actually distributed throughout the galaxy, rather than being nuclear — hence, no N: these galaxies are LIERs. Instead of AGN, the sources may be newly born white dwarfs. Here’s the press release. The final speaker was Jessie Runnoe (Pennsylvania State University), who captured everyone’s attention with the topic of “changing look quasars.” We know that quasars can transition from a bright state, where active accretion onto the galaxy’s central supermassive black hole is visible in their emission spectrum, to a dim state, where they look like a normal galaxy. But SDSS has just observed the quasar SDSS J1011+5442 turn off within the span of just 10 years. 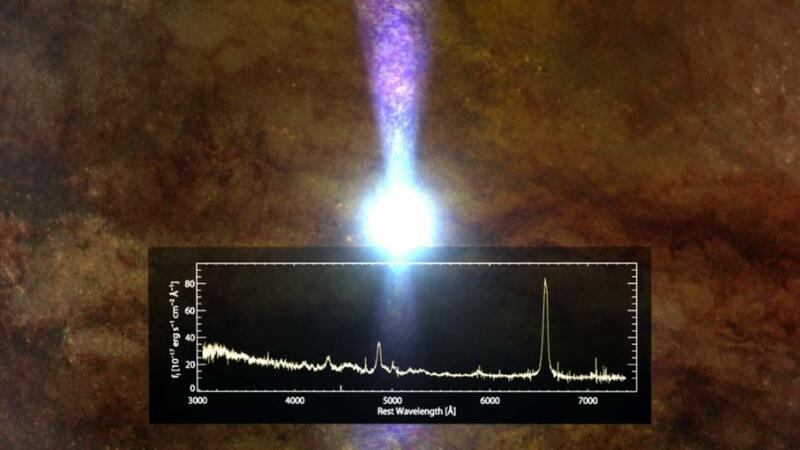 Based on the data, the team concludes that this quasar exhausted the supply of gas in its immediate vicinity, turning off when there was no longer anything available to accrete. Runnoe showed an awesome animation of this process, which you can check out here. Here’s the press release. This talk was a part of the series “Beyond the Academy: Showcasing Astronomy Alumni in Non-Academic Careers.” Matthew Francis is a former academic scientist (with a PhD in physics and astronomy) who transitioned to being a freelance science writer. Wearing a distinctive bowler hat, Francis talked to a room full of students (and some non-students!) about what it’s like to be a science writer. Here are some highlights from among his recommendations and comments. A day in the life of a science writer. 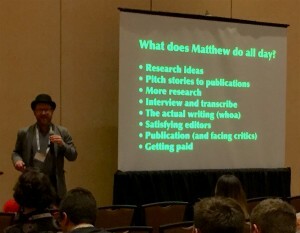 Some sample numbers: he wrote 73 articles in 2015, for 12 different publications. These vary in length and time invested. He supports himself fully by freelancing. The time between pitching a story and getting it published can vary between a few hours for online news stories to months for feature articles. 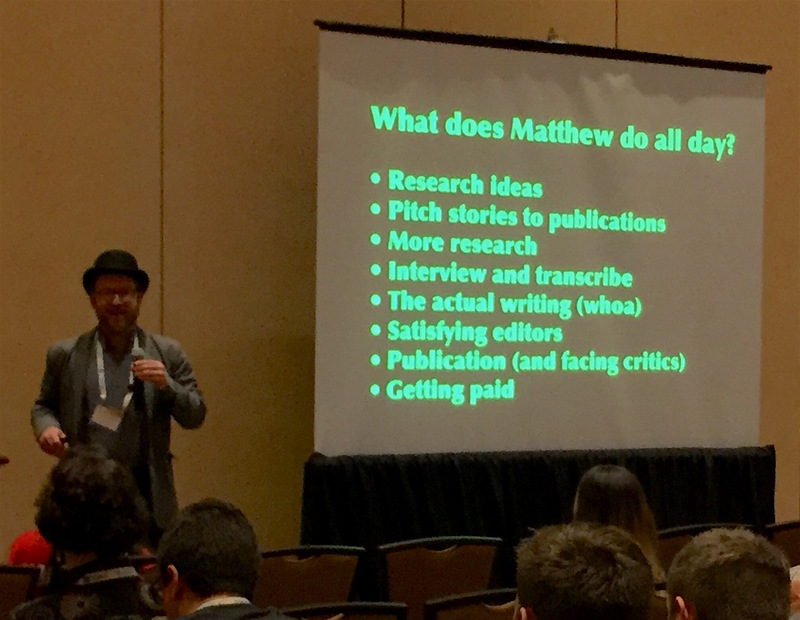 If you’re interested in a science writing career, start blogging now to build up a portfolio. Use your training! As a researcher, you can read plots, understand scientific articles, and talk to scientists as colleagues. These are great strengths. There’s a difference in writing for academics and the public: when writing for academics, you’re trying to bring them up to your level. When writing for the public, that’s probably not the goal. The second-to-last plenary talk of the meeting was given by Keith Bechtol, John Bahcall fellow at University of Wisconsin-Madison. Bechtol spoke about the recent discovery of new satellite galaxies of the Milky Way. Dwarf galaxies orbiting the Milky Way are often hard to spot because they are so faint — while globular clusters have mass-to-light ratios of around 1, the ultra-faint satellites around the Milky Way can have mass-to-light ratios of hundreds or thousands! A combination of better facilities and improved analysis techniques has been lengthening the list of known Milky Way satellites, however: SDSS took us from ~10 to ~30 in the last ten years, and facilities like the Dark Energy Survey Camera (DES), Pan-STARRS 1, SkyMapper, and Hyper Suprime-Cam pushed that number to ~50 in 2015. The new candidates discovered with DES are all less luminous and more distant than previous satellites found. One interesting aspect of this sample is that 15/17 of the candidates fall in the southern half of the DES footprint, and are located near the Large and Small Magellanic Clouds. This anisotropy is not thought to be a selection effect — so is it coincidence, or could they possibly be satellites of satellites? We’re not sure yet! Why do we care about finding Milky Way satellites? There are lots of reasons, but one of the biggest is that they may help us to unravel some of the mysteries of dark matter. These faint-but-massive galaxies were probably born in the Milky Way’s dark-matter halo, and they could be great places to indirectly detect dark matter. In addition, there’s the “missing satellite problem” — the phenomenon wherein the cold-dark-matter model predicts there should be hundreds of satellites around the Milky Way, yet we’ve only found a few dozen. Finding more of these galaxies would help clear up whether it’s the theory or the observations that are wrong. Overall, Bechtol declares, it’s been an exciting year for the discovery of new Milky Way satellites, and with new surveys and facilities still in development, the future looks promising as well! A large contingent of astronomers spent our Friday working on small projects or chunks of larger projects that could be accomplished in a day. Astrobites has written about hack days before. Look for a dedicated recap post with all the great projects later in January!